One of Michael Jackson's ex-bodyguards has come out with a video statement, claiming he has reason to believe that Blanket is his biological son -- a fact that, he says, MJ even confirmed himself. 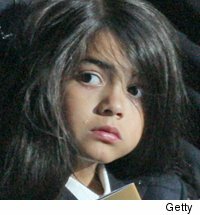 29-year-old Matthew Fiddes made the statement after court docs allegedly leaked, describing how he donated sperm to MJ back in 2001-- sperm that may have been used to conceive Blanket Jackson ... who was born in '02. Despite several coincidences -- the 2001 sperm donation, the resemblance -- Fiddes claims he's still not 100% sure of his paternity ... telling TMZ, "As far as I'm concerned, Michael Jackson is the father." As for custody -- Matt tells us, "If anything happened to Mrs. Jackson, I think Tito Jackson and his sons would be best suited to look after Michael's children." He adds, "I don't want to create a war with the Jacksons again about something so private."